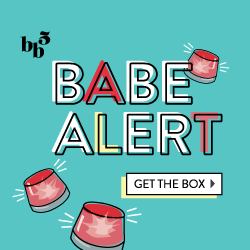 So after much ado of trying to get the Summer FabFitFun VIP Box, such as getting confirmation e-mails saying it was being mailed out multiple times, e-mail spoilers as to what was in it, etc, I finally got my box! I had to contact Customer Service a few times, and so unfortunately I’m on the late-end on posting this review, as most others got their box in early July, but I hope you all enjoy it! 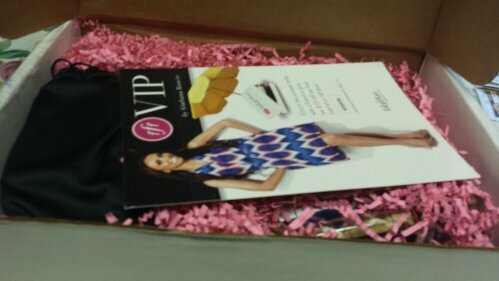 FabFitFun VIP Box is a quarterly subscription box, curated by the one-and-only Giuliana Rancic and of course the FFF Team, and includes various items from Beauty and Fashion to Health and Lifestyle, made for the VIP glamour girl. For $49.99, they ship the often-themed box out every 3 months, and it’s guaranteed to include full-size products that are at least triple the price/worth. I had always been interested in the box, and so when I finally got this one, I was excited to review it! They include an information card that lists all of the different products included in the box so that you know a little bit about them. I like the variety this month: skincare, haircare and beauty products, plus some snacks and a pair of sunglasses! First up are my sunglasses! 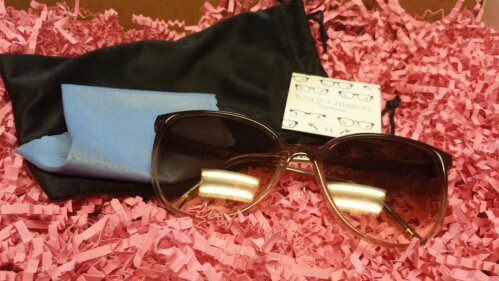 These beauties are Ivory + Mason Sunglasses! I had a bit of trouble finding out the exact name of the design, but I would say they are over-sized tortoise shell frames. I totally love them, even though they are a bit bigger than I usually go, but definitely am happy to have gotten these versus some of the other more hipster-y styles. I currently have Ray Bans and Aviators, so this will be the perfect addition to mix up my collection. At approx. $135 a pop, I will definitely take care of these babies! One of the cool things is that if you didn’t really like your pair, you can exchange them for about $10 directly through the website. Next up we have Orly Nail Polish in Choreographed Chaos and Catalina Su Lipgloss. The shade of the Orly Nail Polish is a very bright bold pink and definitely not for a wall-flower type of girl. It’s a bit more ‘in your face’ than what I usually wear, but I’m sure I will get use out of it. The Catalina Su Lip Gloss is apparently a staple in Guiliana’s makeup bag, and so of course I wanted to test it out. It has a very faint, universal color to it so it would work with any skin color. I’m not a huge lip-gloss person, but have to say this is a nice, simple gloss. 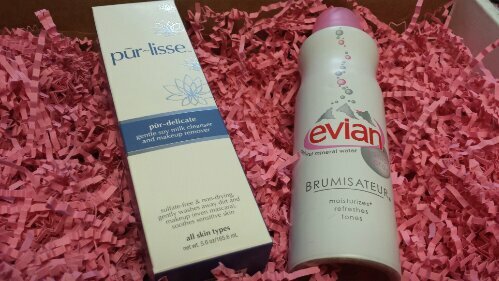 Now are two facial products: Purlisse Pur-Delicate Gentle Soy Milk Cleanser and Evian Brumisateur Facial Spray. The Pur-lisse cleanser is supposed to be great for all different types of skin as a daily, non-harsh cleanser to remove oils and maintain clear skin. I’m very invested in my skincare and making sure I have flawless skin, so I’m all about this product. The Evian Facial Spray is one of those items I would never go out and buy myself, but love to test out. I feel so VIP and famous having an Evian spray to refresh my face. I wish I had it earlier in the summer like during the heat wave in July, but I’m sure I’ll use it here and there. I recently received a similar item in my August GlossyBox so I’m all set with refreshing sprays for the rest of the year! Next up we have two super-summery items! It Hair Care Surf Spray adds to my never-ending collection of Beachy Hair Sprays, as I received them in my July Ipsy Glambag and August Blush Mystery Box. But hey, I’m not complaining! I love summery waves, and so I’m definitely excited to try out this product. The Infinity Sun Glow on the Go is a self tanner, as many of you know from previous posts how much I love self tanner! I was so excited and I can’t wait til I have some downtime to try it out. I think I’ll have to invest in a mitt, but fingers crossed this gives a nice natural and non-streaky glow. 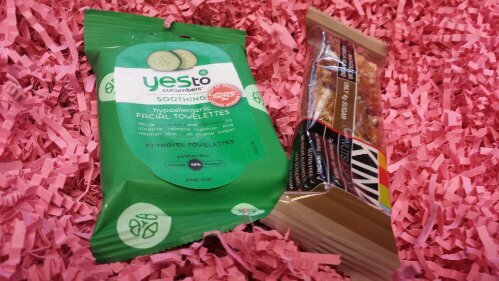 To wrap it all up, I also got Yes to Cucumbers Facial Towlettes (10 ct.) and a KIND Bar in Madagascar Vanilla Almond. I already love Yes To products, and have tried out a few different types, like their Yes To Tomatoes Facial Scrub and Yes to Carrots Body Butter, so of course I was pumped to get these! The cucumber is nice and soothing and this is perfect if you just need a ‘quick rinse’ or as makeup remover. I’m so-so on liking KIND bars. I think I just had a bad experience with a Coconut Almond one, and just wasn’t loving the flavor, however I tried out this one and liked it a looottt more. I definitely want to get my hands on a fruit-and-nut blend and try it out. So here’s my whole collection!!! I think I’m most excited for the Ivory + Mason Sunglasses, IT Surf Spray, Pur-lisse Cleanser and Infinity Sun Glow Self Tanner. I really like the combination of items: you don’t just get makeup, or just hair products, but a perfect mix of box and more! 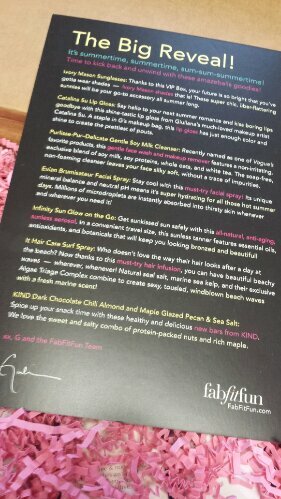 I have to say it was worth the wait, and hope that FFF keeps this quality and quantity of products for their Fall Box. If you’re interested in signing up for the Fall FabFitFun VIP Box, click here and you can get a bottle of the Pur-lisse Cleanser if you do it soon! And I thought my box was late! I definitely like your sunglasses 1000000x better than mine. They sent me ones that look like they’re for a 12 year old. Love your reviews!